The garden is looking a little, well not so good. Maybe its time to do less mowing and more planting. Could be the lawn is so bad its time to start over. If you have considered any of these projects, chances are you have thought about a tiller. Tillers are simply a machine that mixes and chops the soil to make it useable for planting. Most tillers dig about 4 to 6″ deep in the soil, but with multiple passes can get further into the ground. Tillers come in many different sizes, with each having a specific purpose. The smallest of these tillers we call cultivators. Cultivators were popularized by the brand name Mantis. They are small, lightweight tillers that can literally be picked up by one hand. They work great on raised flowerbeds or loose soil where a larger tiller just cant go. Just remember, they may be the least expensive but they will definitely not replace a larger tiller despite what the commercials on TV say! The next size up is the 3.5HP or 5HP Tiller. These are both front tine tillers that are designed for soil that is soft or has been tilled in the past. Another name for these are garden tillers or Merry tillersThese are great for cultivating weeds or working on existing plant beds. Notice we haven’t gotten to a tiller that can handle breaking ground or tilling hard soil. That is all about to change. If you have need for such a tiller then its time to meet the Barreto hydraulic rear tine tiller. This workhorse is self propelled, has reversible tine controls and can handle the toughest yard you throw at it. If you are turning some of your existing lawn into a garden area or if you are replacing your lawn and want to till everything up, this is the tiller you need. It should be noted at this time that the bigger the tiller, the easier it is to operate. Less stress and work by the operator is always a good thing! There are also larger tillers available if the job is a very large yard, or even a field. Then we can get into tractor tillers or attachments for a Dingo or Bobcat. 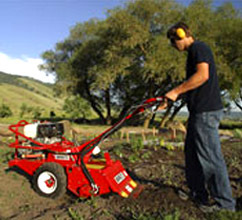 As you can see tillers come in a range of sizes, make sure to match your job with the right equipment. If you still have questions stop by or call one of our stores, we would be glad to help you out. Get out there and start planting!